With exam season looming it can often be difficult to know how best to organise your time and make sure that you are being productive. Here’s a look at an example revision calendar for a productive week. See and save the timetable here. 9am- 11am: Start with your least favourite subject. I always find that I am most productive in the morning, so tend to focus on my least favourite subject at the beginning of the day. This helps make sure that I am in the best frame of mind to work on it. 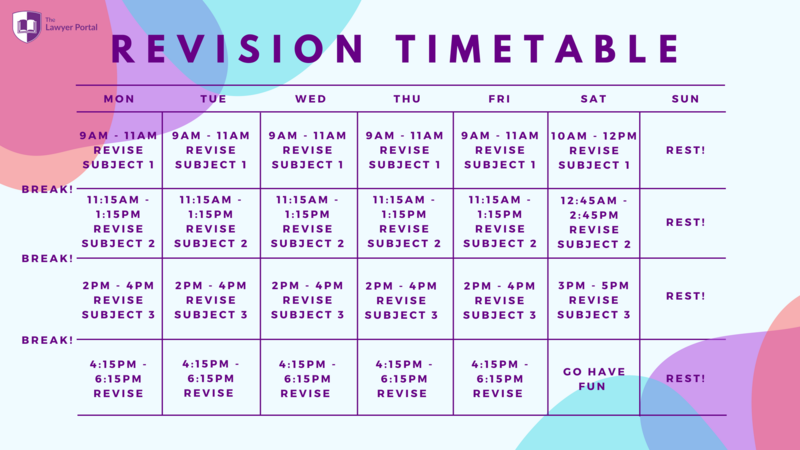 It also means that when you reach that dreaded revision clump at around 3pm, you know you’ve done all of the hard work already, 11am-11:15am: Make sure to get away from where you have been revising during your break. This might be going and grabbing a coffee or even taking a quick walk. Sometimes I like to go and watch fifteen minutes of TV in between my revision. I find quick fifteen minute breaks help me stay focused during the hours that I am revising. 11:15am-1:15pm: Switch to a new revision topic. By rotating around different topics throughout the day, you make sure that you keep all of them fresh in your mind and that you’re paying equal attention to each one. It also means that your day will be more varied and feel less monotonous. 1:15pm-2pm: Make sure to pack something nice to eat over lunch. Revision is tough enough without you living on a diet of caffeine and boring sandwiches! Again, make sure to get away from your work space and stretch your legs so it feels like a proper break. Going for a short walk outside will prevent you from having that claustrophobic feeling of being inside a library all day. 2pm-4pm: Move on to your final topic of the day. I find three topics a day is the maximum you can do so as to make sure you give enough attention to each. I would suggest doing your favourite topic during this time as I always find that the hours after lunch are when I am least productive. 4pm- 4:15pm: Take another break (your last one, which means you’re nearly there!) 4:15 pm- 6:15 pm: Return to one of the three subjects you have focused on today. Was there a particular subject that you felt needed more time or that you are not feeling as confident about? 6:15pm onwards: Try and make sure you’re still doing things that you enjoy in the evening. Exercise is a really good way of unwinding and helping tire you out before bed so definitely try and work it in to your schedule where possible. I also find that having something to look forward to makes me more productive during the day so make sure you’re still making plans with friends. I tend to have a slightly shorter day of revising on a Saturday as this means that I can have a bit of a lie in and arrange to see friends in the evening. It also means that it breaks up the week and stops me from feeling like I am revising non-stop. It can also be good to change your work environment at the weekend. If you’ve been in the library all week, working from home can be a nice alternative. Just make sure it is somewhere where you can work without being distracted by flatmates or background noise.